Former London Welsh and Swansea No.8 Davies made his international debut in 1969 and went on to become one of the most influential players ever to wear the red of Wales and the British & Irish Lions. Born in Swansea, 'Merv the Swerve' moved to London to become a school-teacher and signed for London Welsh in 1968, from where his obvious talents were quickly recognised and he made the first of his 38 appearances for Wales against Scotland the following year. He won a Triple Crown in his first international season before claiming a Grand Slam and being selected for the Lions' famous tour of New Zealand in 1971. Under the tutelage of coach Carwyn James and the leadership of Davies' fellow Welshman John Dawes, the Lions won the series 2-1 with Davies starting all four Tests in the back-row alongside a combination of John Taylor, Peter Dixon and Derek Quinnell. Davies was an indelible presence as Welsh rugby grew form strength to strength during the 1970s, his rangy presence contributing to the golden era in a superb pack. In 1974, Davies was included in his second Lions squad, this time to tour South Africa. Davies again played all four Test matches and helped the Lions complete a famous unbeaten tour, the Test series eventually won 3-0 after a draw in the final match. Davies was handed the captaincy of Wales in 1975 and skippered the side to the Five Nations Championship that year and the Grand Slam the following season. 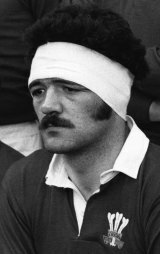 Having returned to Swansea, Davies was widely tipped as the likely skipper of the 1977 Lions but he had his career cut short by an intracranial brain haemorrhage suffered during a Welsh Cup semi-final clash with Pontypool in 1976. Davies was forced to retire from the game at the age of 29, but left a treasure trove of memories. He was inducted into the IRB Hall of Fame in 2001 and the following year a poll of Welsh rugby fans saw him voted the greatest ever Welsh captain and the greatest ever Welsh No.8. Davies but sadly lost a long battle with cancer on March 16, 2012 - just one day before Wales went for a possible Grand Slam against France.